The majority of my game playing nowadays is done on my Nintendo Switch. Up until a month ago I had an Xbox, but it was collecting dust so I gave it to someone who would put it to use. Living in New York City makes the Switch’s portability a no-brainer. I can play on the train, at the studio in the morning, or even at a coffee shop while I wait for someone to show up. I wish I could forget everything about this game and play it all over again with fresh eyes. The whole journey was a treat. You can read my full review here. So much to say about this one. I’m close to the end, hopefully I’ll wrap it up soon and do a proper review. 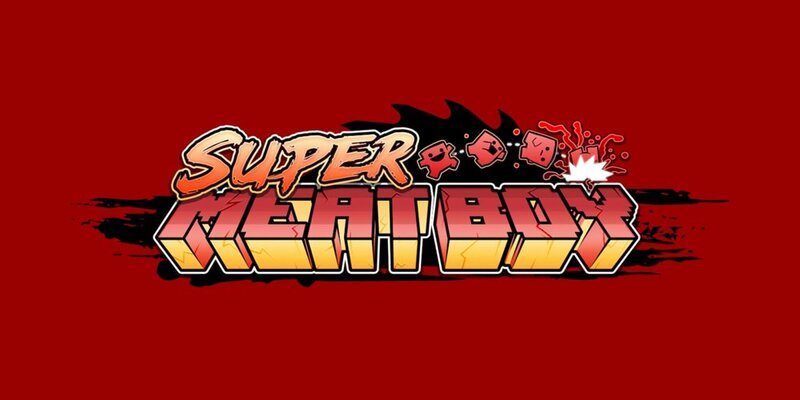 It’s an indie metroidvania created and developed by a single person. Yes, the entire game. It’s as impressive as it sounds. Still images do not do the game justice. A re-release of a Nintendo Wii U game that didn’t get a lot of exposure because the system didn’t sell well (the Switch has sold more in 12 months than the Wii U did in its entire lifespan). Bayonetta 2 is a hack n’ slash acid trip through a universe heavily influenced by Dante’s Inferno. You play an anti-heroine witch from below fighting the minions of the light above. It’s wild. A roguelike twin stick indie shooter. You choose one of a handful of characters and see how many levels deep you can get in a procedurally generated dungeon. Lots of humor, great art direction; still haven’t gotten all the way through. A role playing game (RPG) straight out of Japan (aka JRPG), it’s a story about a kid who inherits the responsibility of saving the world. The battle system is MMO style (aka. Massive Multiplayer Online game where you auto-attack and choose your specials), and the art direction is straight up anime. An old Indie game in the same vein as Celeste. It was originally released in 2010, and its age shows. It reminds me of the old flash games you could play on Newgrounds. As a matter of fact, I think that might be how it originated. Don’t quote me on that. It’s a good game; I tried it just to see why the game was mentioned so often in conversations about Celeste. Video games are a big part of my life. I was introduced to gaming with the original Nintendo Entertainment System, and Nintendo 64 defined my early childhood. Part of why I wanted to keep this blog is to open up the conversation about video games. It isn’t spoken about nearly as often as other hobbies despite how common gaming is. Be on the lookout for a longer post about why I believe video games are the pinnacle of art. For now, check out Celeste. Video game genres come in a lot of flavors. Like movies, there are genres, subgenres, and complete mashups. 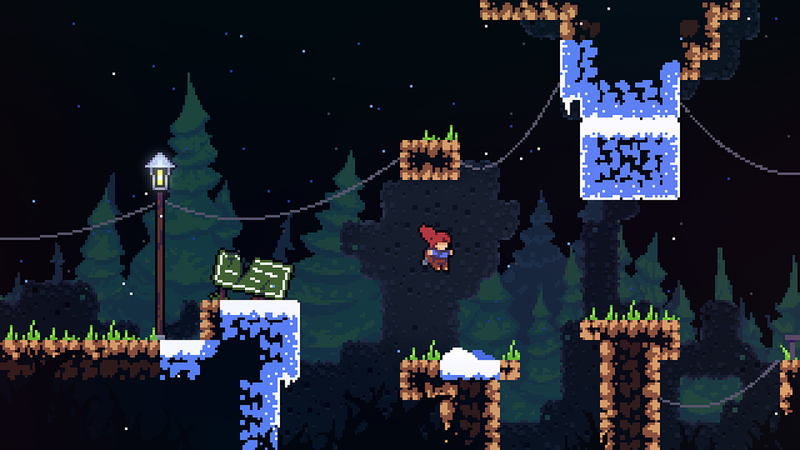 Celeste, the new game by indie studio Matt Makes Games Inc., is a platformer. For the uninitiated, a platformer is a game that involves, well, platforms. The most universal example is Super Mario Bros. Remember going from right to left, jumping from one little platform to the next? There you go. Over the years platformers have evolved from 2D to 3D, most notably with Super Mario 64 (SM64), one of the first 3D platformers to absolutely nail the third dimension. Since SM64 back in 1996 the majority of game developers began translating their games to 3D. And rightfully so—if done well, it adds another level to the experience. That was twenty years ago, however. The novelty has faded, games in 3D are now the norm. In more recent years 2D games have been making a comeback because, despite their old-school flavor, now they're the novelty. Enter: Celeste. Celeste is a retro pixel-art 2D platformer with a meaningful story. It stars Madeline, a young woman with anxiety issues who decides to climb Celeste Mountain. Despite the game’s simple controls and visual style it manages to weave complex gameplay with an engaging story throughout. They say the the best stories start as close to the end as possible. If that’s the case, then Celeste nails it. Madeline’s story starts at the bottom of the mountain, right when she decides she’s going to scale it. Within moments you’re given control and through a short playable intro sequence the game teaches you it’s three buttons: Jump, Climb, and Dash. Then you’re off. Unlike other games or genres where your character earns abilities as you play, Madeline’s three moves are all she has throughout. This makes entire game an even playing field—instead of the game’s character getting better, you have to get better. 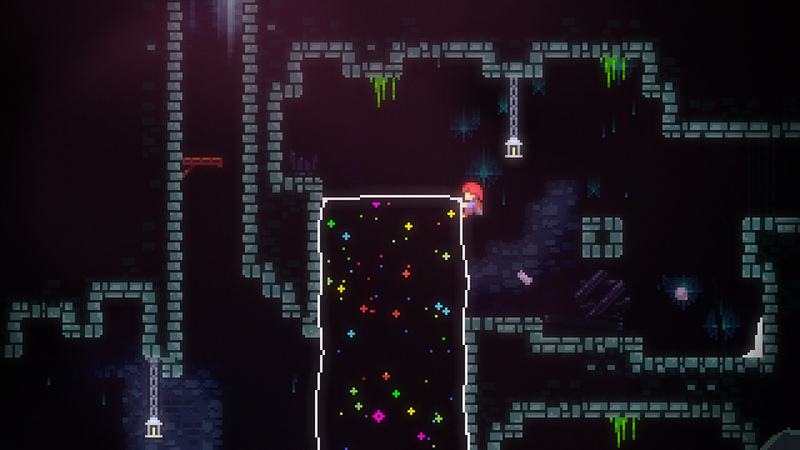 Celeste is broken down into several levels. Each level is divided into screens. Each screen is it’s own challenge that you have to solve and perform. The whole game is a combination of puzzles and platforming that push you to think harder and play better. The game is tied together by a narrative that anyone can relate to: the constant battle against oneself. You will die. Over and over. But there’s a sense of progress despite the difficulty. Every time Madeline crashes into spikes or falls into a pit, you, the player, know exactly what you did wrong. Slowly you learn how to solve each screen. It never feels impossible. There were times where I would die 50 times trying to pass an area, and, despite wanting to throw my Switch against the wall, I got better with each attempt until I finally succeeded. Let’s face it, we look back on classic games with rose colored glasses. Sure, we say games like Celeste are retro, but if you actually go back and play the oldies your glasses are abruptly ripped from your face as you realize just how far we’ve come, even with pixel graphics. Celeste is triumphantly beautiful. Each new area of the mountain is unique, the way the story is presented never fails to be touching, and Madeline is incredibly expressive despite being a sprite based character. (Just watch her walk into a strong wind or dangle her legs from a high wall and you’ll know what I mean.) All this beauty is wrapped up in solid presentation—the Celeste logotype is fantastic—and playful art direction. I’m not a musical guru. Hell, I’m not even a musical bystander. I’m terribly at nearly all things audible (I’ll stick to visuals, thank you), but even I can recognize the effectiveness of Celeste’s soundtrack. Simply put, the team has managed to put together ambient old school tunes that both reflect the environment *and* what you and Madeline are facing. Winds whipping at you on a sunny cliff? The music is both tantalizing and bright. Lost in a dark maze? You’re going to hear ominous riffs and looming beats as you slowly make your way. Celeste is a must-play. The main story is moving, lasting around ten hours long at just the right difficulty. For those that want more, there are hard B-side levels and even harder C-sides to push you to your limit. The latest episode of Eureka features Raad Ahmed, a fellow entrepreneur committed to the long haul. His company, LawTrades, makes it significantly easier to connect with a lawyer and get the help or advice you need. I highly recommend it. Raad Ahmed, founder and CEO of LawTrades, joins us to chat about how he's trying to make legal services more accessible, starting a company, and what he's learned along the way.